When debilitating migraines left a Newburgh woman desperate, the multidisciplinary team at Westchester Medical Center found a solution. Hope for a cure had all but dissolved. However, in 2017, she read an article, and then saw a television news segment about WMC Headache Specialists at Westchester Medical Center, the flagship of the Westchester Medical Center Health Network (WMCHealth). She immediately scheduled a consultation. Led by renowned authorities across numerous fields of medicine, WMC Headache Specialists is the New York-metropolitan area’s first integrated academic multidisciplinary center focused on the care and surgical cure of headaches. To complement the medical staff’s expertise, a psychologist also meets with the team monthly to review the psychological aspects of each patient’s care. The first stop in Canfield’s journey toward a cure was to search for clues potentially overlooked by previous physicians. “When you see a new patient, it’s important to distinguish between a primary and a secondary headache,” says neurologist Jin Li, MD, Chief of Neuromuscular Medicine at Westchester Medical Center. Along with Dr. Rogg, Dr. Li re-established Canfield’s diagnosis and set her on a path toward definitive recovery. “A secondary headache would include the headaches from tumor, stroke or infection,” she says. “After those are ruled out, via MRI and lab work, and sometimes even a spinal tap, you can then focus on primary headache syndromes, such as migraine or occipital neuralgia,” a condition in which nerves from the spinal cord to the scalp are inflamed or injured. Extensive testing revealed that Canfield had undiagnosed degenerative disk disease, as well as history of a head trauma following a serious fall. “Based on these factors, we diagnosed her with occipital nerve neuralgia and referred her for pain management,” Dr. Li says. “The first thing that I do is confirm the diagnosis,” says Nitin Sekhri, MD, Director of Pain Management at Westchester Medical Center. He describes his role as the “bridge between medical management and surgical intervention.” The diagnosis of occipital neuralgia was confirmed when Dr. Sekhri administered a lesser occipital nerve block, medication that eliminated the pain. “The relief lasted for about six weeks,” he says. 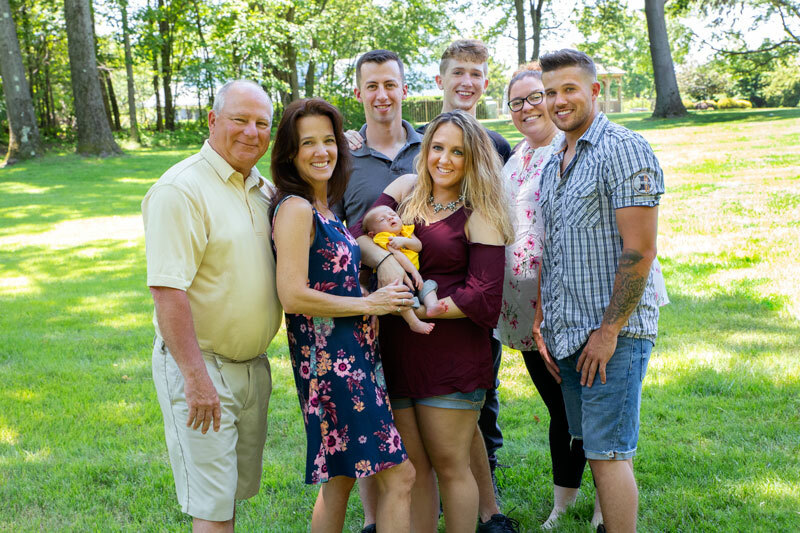 (From left) Husband Jerry, Susan, son-in-law Brendan, baby Declan, daughter Danielle, son Garrett, daughter Rachel and son Brandon. Canfield was deemed an ideal candidate for surgical intervention, yet she was still a bit nervous. “But I decided that either I would have the surgery or live with these headaches forever,” she says. After consulting with Dr. Alizadeh, Canfield underwent surgery in March. Small incisions in the back of the head freed constricted nerve endings that were causing pain. “The procedure was pioneered by a plastic surgeon because they have a deep understanding of nerves, muscles and blood vessels,” explains Dr. Alizadeh. “It’s a simple procedure that results in significant improvement for 90 percent of patients. Sixty percent of patients are completely cured,” he notes. To make an appointment, call 914.909.6880 or visit westchestermedicalcenter.com/wmcheadachespecialists.